Our customers can choose from six basic materials which come in durometer ranges from 60-70 hardness depending on the chosen material. 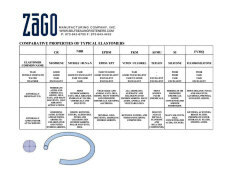 In addition to the materials listed below, other materials are available upon request. Our EPDM compounds are commonly used in outdoor environments and are excellent for weather & water resistant applications/appliances having excellent ozone, steam and chemical resistance. The standard temperature range for EPDM ranges from –54°C to 107°C and –65°F to 225°F. Other temperature ranges available upon request. Our neoprene compounds are commonly used in the refrigeration industry for their resistance to ammonia and freon. Neoprene is also used for numerous applications in the automotive industry because of its excellent resistance to oil. Resistance to ozone, sunlight and oxygen also make this a great choice for products exposed to adverse weather conditions. The standard temperature range for neoprene ranges from -40°C to 107°C and –40°F to 225°F. Our silicone rubber has an excellent temperature range and can withstand low temperatures without becoming brittle. 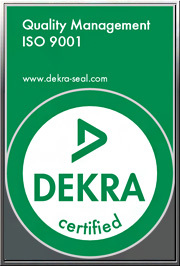 However, it is usually not recommended for dynamic seals because it does not have optimal solvent or oil resistance. The standard temperature range for silicone is from -62°C to 204°C and -80°F to 400°F. Our fluorosilicone compounds are commonly used in the automotive and aerospace industries because of their excellent fuel, oil and solvent resistance. 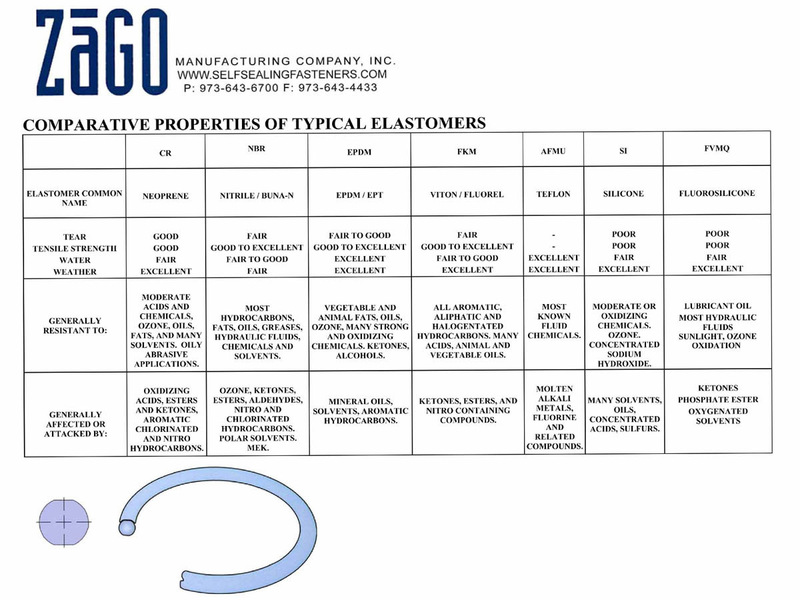 The standard temperature range for fluorosilicone is from –55°C to 177°C and –67°F to 350°F. Our Viton compounds are the preferred choice when seals are required for aircraft engines and automotive fuel handling because of its excellent resistance to high temperatures and harsh chemicals. 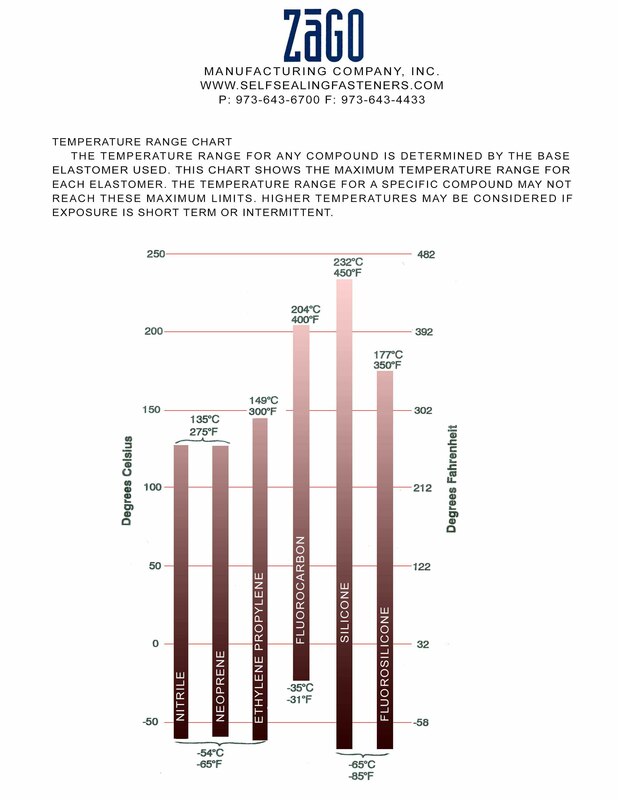 The standard temperature range for Viton is from –29°C TO 204°C and –20°F to 400°F. Any application of an elastomer in an environment with temperatures near its extreme cold or hot limit should be tested to assure performance.